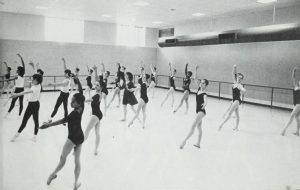 A ballet class shown in the 1980-1981 catalog. School bulletins and catalogs for the University of North Carolina School of the Arts (UNCSA) dating from 1965-2002 are now available on DigitalNC. UNCSA, located in Winston-Salem, serves high school and college students around North Carolina and offers programs in areas such as dance, visual art, drama, and music. The bulletins and catalogs include descriptions of course offering and requirements for each area of study, faculty bios, entrance requirements, a section on the school’s history and purpose, and different rules and regulations of the institution. Student smoking regulations in the 1965/1966 bulletin. Looking back through the bulletins gives an interesting peek into life at UNCSA through the years. The 1965/1966 bulletin includes detailed information about aspects of student life such as how often students could leave campus, when high school students were expected to be in their dormitories, and who could smoke on campus and where. Later bulletins focus more on course offerings, with the scope and number of courses offered growing throughout the years with the growth of the school. To check out all of the new and previously digitized bulletins, catalogs, and yearbooks from University of North Carolina School of the Arts, click here. To learn more about UNCSA visit their partner page or take a look at their website.